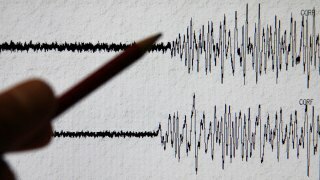 Four small earthquakes struck Oakland near Mountain View Cemetery this morning, according to the U.S. Geological Survey. The first, with a preliminary magnitude of 1.7, struck at 2:05 a.m. and was about 4.2 miles deep. It was centered on Truitt Lane, off of Clarewood Drive. The second, with a preliminary magnitude of 2.4, struck at 2:20 a.m. and was about 3.2 miles deep. It was centered at the south end of Mountain View Cemetery, near Moraga Avenue. The third struck at 2:25 a.m. and had a preliminary magnitude of 1.0. It was about three miles deep and was centered near Bonita and Moraga avenues. The fourth struck at 2:45 a.m. with a preliminary magnitude of 1.5. It was about 3.5 miles deep and was centered near the southeast corner of Mountain View Cemetery.